Becoming a daddy for the first time is a one-of-a-kind experience which definitely deserves a one-of-a-kind First Father’s Day gift. We’ve got you covered with this list of some of the most unique, fun and personal Father’s Day gifts we could find. That way you new moms spend less time trying to come up with something creative for Dad’s big day and more time with Baby…or your bed. It’s quite literally the gift that keeps on giving! Get Dad a subscription to Papa Bear Box, the subscription box geared toward new dads. 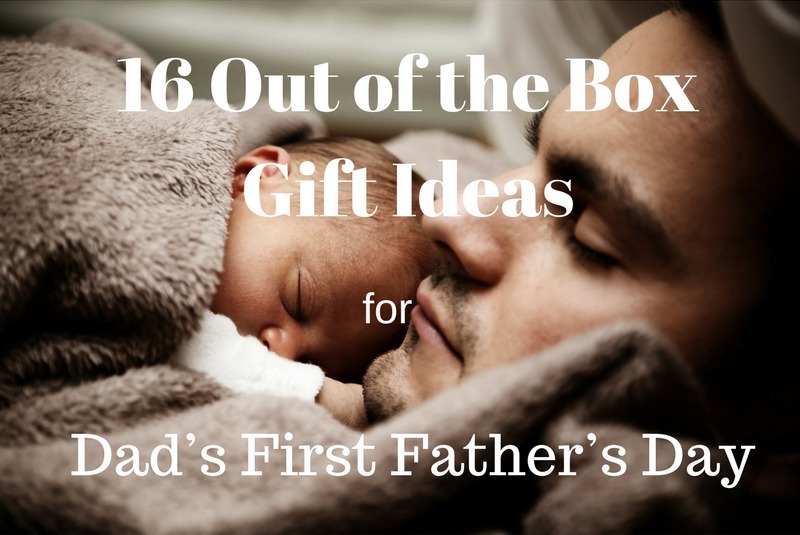 With everything from snacks and grooming supplies to items for Baby, this gift will keep Dad on top of his game while helping to take care of the little one. Buy just one box, pay month to month, or sign up for a 6-month or 1-year subscription! 6-month subscription for $34.95/Box HERE. What’s cuter than gearing up Dad and his new mini me in matching outfits? Nothing, that’s what. Make it even better by playing into Dad’s love of all things nerdy with this hilarious Batdad / Batbaby matching set from Clever Fox Apparel. Batdad / Batbaby Matching Shirt and Onesie for $32.71 HERE. Being a new dad can be stressful. Sometimes after dealing with Baby, all Dad is going to want is to kick back with a nice cold beer. Help Dad do just that with these Beer Bottle Labels from Paprika Paperie. Just peel and stick right on Dad’s favorite beer and he’s all set for those calm-after-the-storm moments. Comes in sets of 4 or 6 with the option of a carrier. 6 labels with carrier for $18 HERE. Give Dad the gift of a day off. Let Dad get away from the diaper changes and spit ups, when he can get back out with his guys and start to feel like a person again, not just a dad. If he likes sports get him tickets to see his favorite team. If he’s the active type, have him hit the slopes for a ski trip or the green for a golf outing. Or how about organizing a camping trip, a canoe float or tour of a local brewery with the boys. Nothing is off limits here. If you are really want to give him something unique that he will likely cherish for a lifetime, you could opt for a custom family illustration. There are thousands of talented artists out there ready to create a custom, one-of-a-kind illustration of your family. Some of our favorite designs are from Pera Design on Etsy. 3-person illustration for $65 (+$15 for each additional person/pet) HERE. For a custom gift that’s even more out of the box, check out these family portrait stuffed characters. These hand-stitched characters from Cromanticamente are an incredibly personal and heartfelt (pun intended) gift that is a little more tangible than a paper portrait but still a great decorative piece. They are totally customizable and OH SO CUTE. 3 custom dolls on twig swing for $80 HERE. Let him proclaim his new-dad status with this Custom Leather Patch Hat from Holtz Leather Co. You can personalize the patch on this hat with any saying, i.e. “Sophie’s Dad Since 5.25.17”. This option does require for you to provide the design that you want imprinted on the patch. For an easier option that doesn’t involve providing the design, check out Quiet Leather on Etsy, which only requires you to choose font, color, shape and what you want it to say. Guys can be very particular with their cars, which means Baby (and the messes that will inevitably follow) could end up putting a lot of stress on Dad. Take a little of that stress away with this sleek Car Organizer. With slots to hold drinks, food and entertainment, car rides with Baby will be a breeze, plus it’s stylish design will be easy on Dad’s eyes. On Sale for $15.99 HERE. Dad isn’t always going to know exactly what to do – that’s part of being a new dad. Take some of the uncertainty away with Be Prepared: A Practical Handbook for New Dads. Both witty and informative, this book is a great way to give Dad a good laugh while also helping him learn the ropes of fatherhood. On Sale at Amazon, Barnes and Noble, etc. If papa is big on sports, he’ll no doubt want to pass that love on to his little one. Matching team jerseys will really make him feel the love. Get Dad a custom jersey (maybe with “Daddy” on the back!) and Baby a team onesie to match. They’ll be looking good and ready to watch their team win. Make it even sweeter for Dad by planning a family outing to go see a game. Custom jersey for $113 HERE. Infant romper for $31 HERE. This is a practical and stylish option to take the hassle out of carrying Baby for those first-time dads. With the Dad Shirt from Lalabu on Fancy he can pop his little one right into the Kangaroo-esque built-in pouch – no confusing straps, ties or carriers necessary. Lalabu Dad Shirt for $75 HERE. Take Dad back in time with this cool, retro-inspired gift. RetroViewer is a new take on those old-school photo and film reels. Handpick photos of Dad and Baby’s favorite moments together (with captions if you’d like) and customize the center to show Dad how much you and Baby love him. Special Father’s Day Edition available now. 1 reel and viewer set for $29.95, $14.95 per additional reel HERE. Dad reading to Baby is an important bonding experience for the pair. Get Dad something he and Baby will both love with Daddy and Me Board Book from Pinhole Press. Totally customizable, you can add your own text and your favorite photos of Dad and Baby. In no time you’ve got a sweet and sentimental gift that will create lasting memories. Daddy and Me Board Book for $39.99 HERE. No professional photographer needed for this gift! All you need is some letters from a craft store and a camera. Just shoot, print, frame, and voila: you have this wonderfully personal (and incredibly low effort) gift for Dad that he is guaranteed to adore. Put in a little more effort by painting the letters to match Dad’s room, office or man cave and this one great gift suddenly turns into two! Idea and photo from The Coleman Chronicles. 12” D and A canvas letters for $8 each, available at Michael’s. Baby is going to leave little footprints all over Dad’s heart. Commemorate that with a Footprint Keychain from Lily Buds on Etsy. Get an imprint of Baby’s actual footprint and the option to add a name, birthday and a short phrase. He’ll always be reminded of the first time he saw those cute little feet. Footprint Keychain for $150 HERE. Sometimes, the best gift to give Dad is the gift of laughter. Get this Funny Onesie from Bump and Beyond Designs for give Dad a good chuckle for Father’s Day. Comes in both short and long sleeve options. Short sleeve onesie for $16.50 HERE.